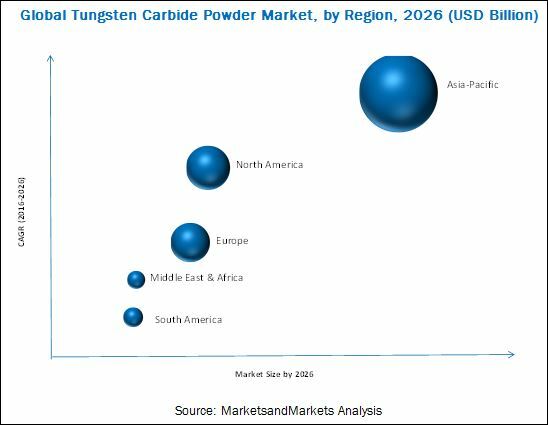 The global tungsten carbide powder market is projected to grow from 14.78 billion in 2016 to USD 24.90 billion by 2026, at a CAGR of 5.4% during the forecast period. The increasing demand for industrial machineries from various end-use industries, such as mining & construction, industrial engineering, transportation, and aerospace & defense, is anticipated to drive the demand for tungsten carbide powder in the coming years. Along with the rising demand for metals, the need to increase their reserve base across the regions has led the market players to increase their spending in metal and mining-related activities. The construction market is also growing, with the increasing large scale investments in various infrastructure-related projects in recent times, after a prolonged period of sluggishness due to the economic slowdown. In this study, 2015 has been considered the base year and 2016-2026 as the forecast period to estimate the tungsten carbide powder market size. Tungsten carbide powder is a high performance chemical compound which contains an equal amount of both tungsten powder and high purity carbon atoms. 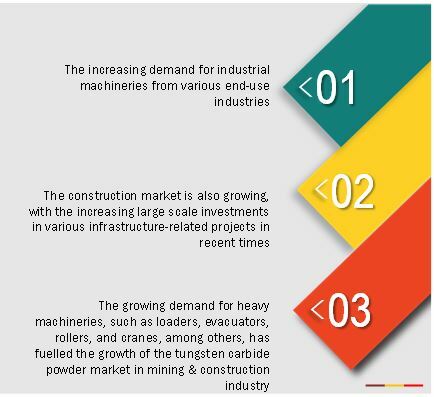 The increasing demand for industrial machineries from various end-use industries, such as mining & construction, industrial engineering, transportation, and aerospace & defense, is anticipated to drive the demand for tungsten carbide powder in the coming years. The construction market is also growing, with the increasing large scale investments in various infrastructure-related projects in recent times, after a prolonged period of sluggishness due to the economic slowdown. Different secondary sources, such as company websites, encyclopedias, directories, and databases such as Hoovers, Bloomberg, Businessweek, Factiva, and OneSource have been used to identify and collect information useful for this extensive, commercial study of the global tungsten carbide powder market. Primary sources, including experts from related industries, have been interviewed to verify and collect critical information and assess prospects of the market. The top-down approach has been implemented to validate the market size in terms of value. With data triangulation procedures and validation of data through primaries, the exact values of the overall parent market size and individual market sizes have been determined and confirmed in this study. This study answers several questions for stakeholders, primarily, which market segments they should focus upon during the next two to five years to prioritize their efforts and investments. These stakeholders include tungsten carbide powder manufacturers such as Sandvik AB (Sweden), Kennametal Inc. (U.S.), Ceratizit S.A. (Luxembourg), Extramet (Switzerland), Federal Carbide Company (U.S.), Guangdong Xianglu Tungsten Co., Ltd. (China), Nanchang Cemented Carbide Co., Ltd. (China), Jiangxi Yaosheng Tungsten Co., Ltd. (China), Japan New Metal Co., Ltd. (Japan), China Tungsten Online (Xiamen) Manu. & Sales Corp. (China), and Eurotungstene (France), among others. In December 2014, Ceratizit S.A. partnered with Grasche (USA) for the distribution of the company’s product offerings, mainly for the North American market. This strategy helped the company maintain a better distribution network, along with superior customer relationship, in the North American market. In September 2013, Sandvik acquired the complete share of Precorp, Inc. (U.S.), a company that offers polycrystalline diamond and carbide tools, such as drills, reamers, end mills, port tools, and micro tools. This acquisition helped Sandvik in providing high speed machining of die cast aluminum, carbide parts, and the machining of advanced composite materials mainly for the aerospace and automotive markets. This research report categorizes the global tungsten carbide powder market on the basis of grade, application, end-use industry, and region. Each class is further described in detail in the report with value forecasts until 2026. Each type is further described in detail in the report with value and volume forecasts until 2026. Each end-use industry segment is further described in detail in the report, with value forecasts until 2026. Each region is further segmented by key countries, such as China, India, Japan, South Korea, the US, Mexico, Canada, Germany, the UK, Italy, France, Saudi Arabia, South Africa, Argentina, and Brazil. The global tungsten carbide powder market is projected to grow from 14.78 billion in 2016 to USD 24.90 billion by 2026, at a CAGR of 5.4% during the forecast period. Growing demand for tungsten carbide powder from various end-use industries, such as mining & construction, industrial engineering, and transportation industries is driving the growth of the global tungsten carbide powder market. The rotary drilling & mining grade segment accounted for the largest share of the global tungsten carbide powder market in 2016. Superior impact resistance, stiffness, and high-performance ability in severe working conditions make rotary drilling & mining one of the most preferred grades for tungsten carbide powder. The machine tools & components application segment accounted for the largest share of the global tungsten carbide powder market in 2016. Increasing adoption of tungsten carbide powder for developing various components such as nozzles, inserts, rods, sheets, buttons, bits, tips, strips, and balls, among others, for various end-use industries are anticipated to drive the demand for tungsten carbide powder in the near future. The mining & construction end-use industry accounted for the largest share of the global tungsten carbide powder market in 2016. Growth of this segment can be attributed to the increasing oil & gas exploration activities and rising government spending towards the development of infrastructures. Among all regions, Asia-Pacific accounted for the largest share of the global tungsten carbide powder market in 2016. This large share can be attributed to the high economic growth rate of countries in the Asia-Pacific region, and investments made across various industries, such as mining & construction, automotive, oil & gas, and aerospace & defense. China, India, and Japan are the leading consumers of tungsten carbide powder in the Asia-Pacific region. The mining and construction is the largest and fastest growing end-use industry of the tungsten carbide powder market. The mining & construction industry requires large and strong tools for operations and activities, such as surface mining, soil stabilization, asphalt reclamation, drilling, and tunnel boring, among others. Tungsten carbide has excellent properties, such as resistance to abrasion & impact, toughness, and hardness, to meet these requirements. In the mining & construction industry, tungsten carbide is used in machining and fabricating equipment, such as cutting tools, and so on. Tungsten carbide finds application in coating steel or titanium equipment that are used in mining & construction activities. The growing demand for heavy machineries, such as loaders, evacuators, rollers, and cranes, among others, has fuelled the growth of the tungsten carbide powder market. The rising residential & commercial infrastructure activities in Asia-Pacific and the growing demand for minerals and commodities, such as gold, silver, copper, and coal, among others, from North America have accelerated the growth of the mining & construction industry. Industrial engineering is the second largest end use industry of the tungsten carbide powder market. Industrial engineering industry comprises designing, improvement, and installation of resources, such as man and machines to manufacturing operations to gain optimum productivity. Machines are exposed to wear & tear causing lower productivity. Therefore, usage of tungsten carbide in the manufacturing of industrial machines and components helps reduce maintenance and improve the run-time of the machines, which lead to enhanced productivity. Tungsten carbide holds excellent chemical and physical properties that makes it suitable for fabrication and tooling applications. It is used for machining materials, such as stainless steel, titanium, and other alloys. What are the upcoming industry applications for tungsten carbide powder? The global tungsten carbide market is witnessing significant growth. However, Oversupply by China inhibits the growth in production of other prospective countries, such as the U.S. and Germany, which have decent reserves of tungsten. A tungsten mine in Canada suspended its operation in late 2015 owing to the fall in prices between 2014 and 2015. During the same period, countries such as the U.K., Zimbabwe, and Vietnam, having faced intense competition to meet the global demand for tungsten, started additional production of ammonium paratungstate (APT) and tungsten oxides. Key market players operating in the global tungsten carbide powder market, such as Sandvik AB (Sweden), Kennametal Inc. (U.S.), Ceratizit S.A. (Luxembourg), Extramet (Switzerland), Federal Carbide Company (U.S.), Guangdong Xianglu Tungsten Co., Ltd. (China), Nanchang Cemented Carbide Co., Ltd. (China), Jiangxi Yaosheng Tungsten Co., Ltd. (China), Japan New Metal Co., Ltd. (Japan), China Tungsten Online (Xiamen) Manu. & Sales Corp. (China), and Eurotungstene (France), among others have adopted various strategies to increase their market shares. Partnerships, agreements, joint ventures, mergers & acquisitions, new product launches, and expansions are some of the key strategies adopted by market players to enhance their presence in the global tungsten carbide powder market. 12.6 Guangdong Xianglu Tungsten Co., Ltd.
12.7 Nanchang Cemented Carbide Co., Ltd.
12.8 Jiangxi Yaosheng Tungsten Co., Ltd.
12.9 Japan New Metal Co., Ltd.
12.10 China Tungsten Online (Xiamen) Manu. & Sales Corp.
12.12.3 Zigong Huagang Cemented Carbide New Materials Co., Ltd.